Any December 23rd shoppers here? Yep, me too. I've got a long history of procrastinating my holiday shopping, but I'm starting to come around to the idea that those people who start shopping in November may not be crazy... maybe they're sane and I'm the crazy one? To encourage us both to jump-start our holiday shopping, I created this holiday gift guide with products from some of my favorite Columbus makers! I love giving my family and friends gifts from local makers: not only does it mean I get to give them something they wouldn't be able to walk into any ole' store and get for themselves, it also helps support another maker. And I'm alllll about that. Full disclosure: I've become friends with every single one of these lovely makers over the past year as I've peddled my weavings to different craft shows. I am absolutely biased -- mostly because they're all amazing ladies. This lovely set from herbalist Aniko Zala includes: 1 dream balm, 1 gentle face wash, 1 lavender sea scrub, and one herbal lip balm. We all have a few ladies in our life that spend so much of their time taking care of everyone around them and not enough time taking care of themselves. Give her the gift of self care this year! How adorable is this living succulent terrarium necklace from Kirsten West of Bear Roots Floral! She just opened her retail store in Clintonville so you should definitely stop by and grab one of these pretties for the plant-lover in your life! She also carries a slew of products made by Columbus creatives in her beautiful store. Take it from this red-head: get the red-head in your life a mustard scarf, specifically this one from TL Yarn Crafts by Toni Lipsy. I don't know what kind of voodoo magic it is, but the mustard, red-hair, pale skin combo is two-thumbs up. Don't worry if you don't have any red-head friends; Toni offers it in basically every color imaginable! Get a woman you love one of these "Women We Love" organic hand lotions! Tina De Broux is the lady behind Under Aurora and these lotions are a special collaboration between her and illustrator Leigh Cox. Four scents available, each inspired by a woman who was a creative visionary of her time: Nina Simone, Maya Deren, Ruth Asawa, and Nico. Heidi Kliewer is the creator of Lily Noelle, a sassy and colorful jewelry business with the perfect statement piece for the fashionista in your life! Love this gold wood and leather tassel necklace as a classy way to dress up your outfit. My mom is going to be getting a Lily Noelle piece for sure this year -- shhh, don't tell her! For the traveler in your life, take a look at Pokeycan's sewn luggage tags and passport covers! Nicole Shepherd offers both of these products in all kinds of fantastic prints, along with totes, makeup bags, and other products. Nothing says adult like upgrading from that crinkled airline paper tag to a real luggage tag! I know you've got someone in your life that's jumped on the enamel pin bandwagon -- and who wouldn't want to when they are just so fun and cute! Get her some flair from Glitteracy, run by Chelsea Kilmer. I'm the proud owner for the Hustle Pig pin and the Ohio girl pin... but I definitely know a few cat-lovers in my life that need that Meow Five pin. Okay, you probably won't be able to wait to give these pumpkin pie earrings to the pie-lover in your life; after all, Thanksgiving is just around the corner! These adorable polymer clay creations are made by Amy Neiwirth of Sweet Stella -- she creates all kinds of wearable sweet treats. I'm eyeing some gingerbread cookie earrings for myself this year. 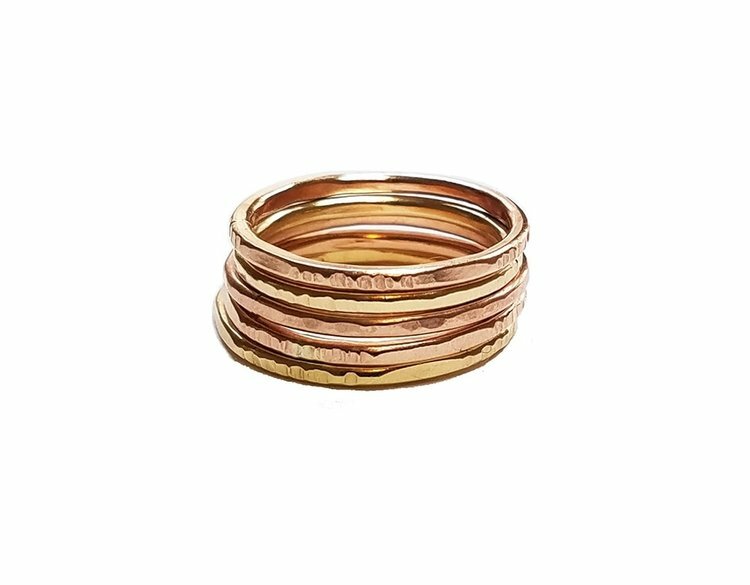 All of Hannah's pieces are gorgeous, but I particularly love these stacking rings. I'm a sucker for the hammered texture and obsessed with anything rose gold. A few of these rings would make such a lovely gift for that friend who rocks an understated jewelry style. People loveeee their Ohio-gear and showing some hometown pride -- so get the Ohio-lover in your life a hometown pendent necklace from Dericole Designs! Made by Nicole Derifield, these metal-stamped necklaces make beautiful, simple statement pieces. Is anyone else completely obsessed with the shibori dyeing trend that's happening right now? I'm constantly drooling over photos of indigo-dyed products on Instagram, including these pillows made by Karla Furrer of Bella Studio. Beautiful gift for a new-homeowner! Accessories are always a safe bet for the female family members of your life, especially if they're as beautiful as this star-patterned wristlet by Ally Eads! I love all of the fabrics Ally incorporates into her work and her attention to quality and detail. All photos are courtesy of the respective makers! Join me in shopping small this holiday season!